Standard manure analysis procedures determine the total N, P, K, and other nutrient content in the manure. Some special analyses such as ammonium-N and water extractable P determine the concentration of specific forms of nutrients in manure. These special tests should be clearly labeled as such on the manure test report. However, the total amount of nutrients in manure may not all be available or may become available only over a period of time. States and regions have developed “availability factors” that are applied to the manure analysis results to estimate the availability of the manure nutrients to the immediate crop and to future crops. 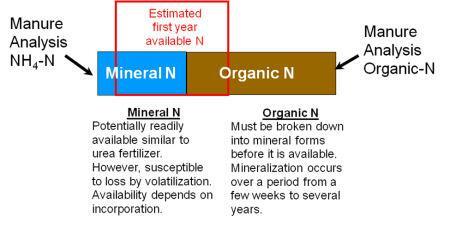 This availability is usually a fertilizer equivalent availability. This is important because soil test recommendations are made on the basis of applying fertilizer nutrients. This means that by using the availability factors you can substitute “available” manure nutrients for recommended fertilizer nutrients on a 1 to 1 basis. Some labs will apply availability factors to the analysis results and show “Available Nutrients” on the manure test report in addition to the analyzed total nutrient concentrations. It is very important to check to see if these factors are appropriate for the area where the manure will be spread. Some labs serve a large geographic area and while their analytical results may be excellent, availability factors may not be appropriate for all areas that they cover. It is always a good practice to check with the local cooperative extension service to make sure the availability factors a lab is using are appropriate for that area. Even if the availability factors use by a lab are not appropriate, the analytical results for total nutrients can be used with local availability factors to get valid estimates of available nutrients.